Our Philosophy is Transforming the unknown into success. For international businesses, the vital first step is to identify and understand the right partner. We support our clients through the important first steps and establishment of successful business opportunities. We established our UK Headquarters in 2010 and in 2012, we opened our Japan office in Kobe. Masako has had over 25 years of experience in managing bilateral business relationships including Japan-US, Japan- Asia and Japan- the UK/Europe. After managing joint ventures and alliance partnerships at the Japan branch of EG&G Inc., Masako was appointed to the Head of Japan office of Ingram Micro Inc. (NYSE:IM) in 2000. In 2002, she relocated to Ingram Micro UK where she oversaw senior-level project management and supply chain management for European level projects. Masako founded Oceanbridge Management (obm) in 2010 with the vision of “Transforming the unknown to success”. Throughout her international careers, she realised that the most requirement in achieving successful global business is to be aware of the presence of a potential partner and to have right mutual understanding, as well as overcoming language and cultural differences. Since 2012, she has worked to create an ecosystem to forge business opportunities between the UK and Japan and established a regional link between Thames Valley (UK) and Kansai (Japan). This culminated with an MoU (memorandum of understanding) between Thames Valley Chamber of Commerce (TVCC) and Osaka Chamber of Commerce (OCCI). Now she holds positions of the Japan Desk, TVCC and Project Coordinator of OCCI (sponsored by Japanese Ministry of Economy, Trade and Industry). She has supported many government organisations, companies and universities both in the UK and Japan for trading, inward investment and collaboration between the two countries, particularly in cross-industry technologies related to energy, automotive, IoT (Internet of Things) and AI (Artificial Intelligence). Michael is responsible for providing technology focused companies with advice and support on new business development, program management and how to sell new technologies. Michael has 25 years of experience working in the telecommunications, internet technologies and the optoelectronics sectors in engineering, product management and business development roles, with a variety of high tech companies. Before starting at OBM, Michael was one of the founder members of a UK photonics start-up which successfully went to IPO. Michael has a BSc in Physics from the University of Loughborough, an MSc in Optoelectronics and Telecommunications from the University of Essex and LAAS/CNRS Toulouse and is a Chartered member of the Institute of Physics. Megumi specialises in business development and market research, including strategic and regulatory aspects. She covers a wide range of industries: - IT, financial, automobile, pharmaceutical, utility and energy. After working with Nissan Motors’ headquarters in Tokyo, she moved to the US and obtained Ph.D in telecommunications policy at Michigan State University. While in the programme she taught international telecommunication. She worked for Kalba Bowen Associates in Massachusetts in the US, then moved to the UK and worked for Putnam Hayes & Bartlett and Nomura Research Institute Europe as a senior consultant. As the co-founder of Globalcom, she has carried out projects for companies such as Nomura Research, Institute, NTT DoCoMo, Screen Digest in the UK, IDATE in France. Megumi also organised conferences in London, Berlin and Hanover. Until June 2018 she taught at Linton School of Global Business at Hannam University in South Korea for two and half years. The subjects she covered in her lectures were artificial intelligence, blockchain technology, communication technology in general; media economics (film, music, gaming, publishing, tourism) and China’s soft/hard power, and global influence. 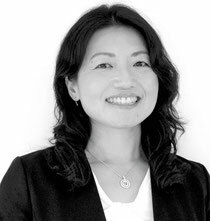 Having resided in the UK for over 25 years, Akiko has worked as a top-level sales executive and account manager at companies such as Panasonic UK’s Direct sales department, Imagistics UK, and Ingento Ltd. In 2003 Akiko joined Sharp UK, having been chosen from 250 candidates. During her time at Panasonic UK and Sharp UK Akiko constantly achieved the No.1 or No.2 position in the sales department and received numerous awards. Since leaving Sharp UK, Akiko has been providing seminars, coaching, and training to improve global business skills at many global companies. These services are based on Akiko’s business experience in Japan and the UK. She has also been a lecturer at universities. Christina’s specialism is strategically connecting business between emerging and developed markets, with her 25 years of experience in international business, working alongside global brand directors and the public sector. She identifies projects, trusted business and diplomatic relationships and advises on new market strategies and in-market strategic partners. Current projects include hi-tech innovations, new market entry, transformational change and corporate psychology, including development of a human-centric style of leadership and emotionally intelligent in-company talent. Her clients are currently based in Latin America, Eastern Europe and The Middle East. As President of The International Club of Leaders for Europe Business Assembly, she travels globally and speaks on influential and human-centric leadership. She lived in Asia for six years promoting opportunities with British-based business and is currently based in the UK. Brian has worked in the UK energy industry for over 40 years. He is a trained power engineer and held various senior management, grid network design and innovation roles while working for Scottish Hydro Electric and SSE plc. He has also been involved in numerous UK utility industries working groups and, therefore, understands how the industry works. Brian has extensive experience in supporting UK and multinational companies, in the areas of sustainable developments, smart grid, electric vehicles and renewables. Brian's other roles include Director of Shewan Associates, Associate Director of Thames Valley Chamber of Commerce, and Chair of local council’s Energy and Climate Change committee. Brian also holds the post of senior research fellow at the Energy and Climate Change Division at the University of Southampton. David has over 40 years of experience in the electricity supply industry as a Chartered Electrical Engineer at UK distribution network operators (DNO) , the energy regulator (Ofgem), BC Hydro (Canada), and General Electric. While at Ofgem, David supported the technical review of network companies, including all of GB’s Transmission and Distribution businesses. He has also been involved in DNOs' innovation projects including Lead Technical Architect on SSE’s Thames Valley Vision. At present, David advises on a Smart Energy Network Demonstrator project at Keele University and supports DNO to develop new analysis methods for smart metering data directed at detecting high technical and non-technical losses. He also supports generation investors on opportunities to connect to the DNO networks. David is a member of the CIRED international conference GB organising committee.